San Juan is a small coastal sailing boat which re-establishes the routes to the Antilles after War of Independence. Full ship model kit San Juan description, photos, video and benefits. Full ship model kit Albatros description, photos, video and benefits. The Apóstol Felipe was one of the six galleons built by Martín de Arana for King Felipe IV. It formed part of the “Silver Galleons”. Full ship model kit Apostol Felipe description, photos, video and benefits. The topsail schooner Cala Esmeralda was built in Majorca between 1916 and 1919. Full ship model kit Cala Esmeralda description, photos, video and benefits. Cazador played a decisive role as auxiliaries to fleets on missions of exploration, discovery, lookout and mail; specifically during the Algerian landings and the second siege of Gibraltar. Full ship model kit Cazador description, photos, video and benefits. Nice brigantine Corsair was well fitted out with cannons and falconets to practice pirate job. Full ship model kit Corsair description, photos, video and benefits. The frigate Diana was launched on the 10th of March 1792. It formed part of the series of frigates known as “Mahonesas”, as they had been built in the city of Mahón. Full ship model kit Diana description, photos, video and benefits. For twenty years this well-armed ship Del Pilar plied the route from Mexico to Manila. 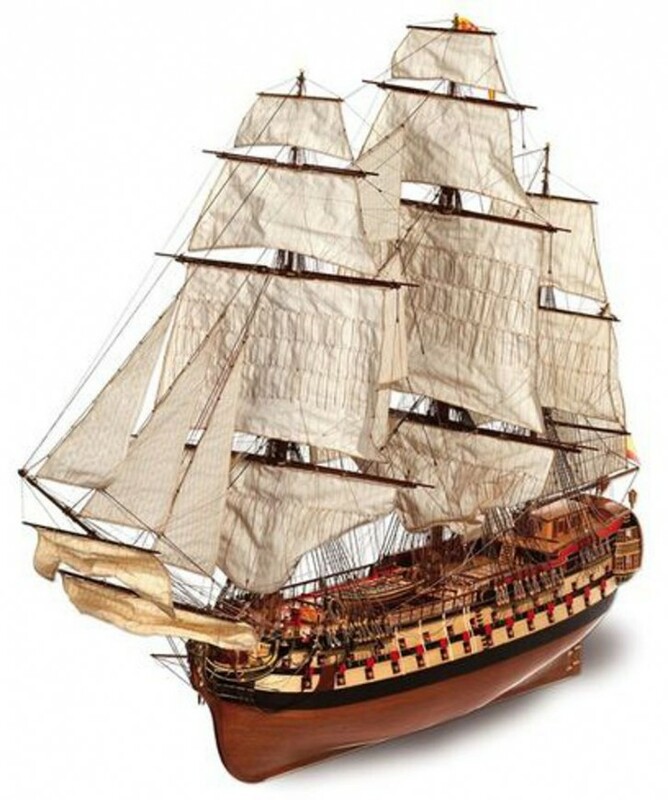 Full ship model kit Nuestra Pilar description, photos, video and benefits. This legendary riverboat sailed the Mississippi throughout the 19th century. Full ship model kit Mississippi description, photos, video and benefits. San Marcos galleon was successful boat in war and trade. Full ship model kit San Marcos description, photos, video and benefits. San Martin was the well-known flagship of the Spanish Armada. Full ship model kit San Martin description, photos, video and benefits. Santisima Trinidad was the biggest warship of the 18th century armed with 130 guns. Full ship model kit Santisima Trinidad description, photos, video and benefits. Dos Amigos was a slaver, one of the famous early 19th century Baltimore clippers. Full ship model kit Dos Amigos description, photos, video and benefits. The Candelaria is a Mediterranean bomb vessel. Full ship model kit Candelaria description, photos, video and benefits. The Bounty was well-known mutiny ship. Full ship model kit Bounty description, photos, video and benefits. The “Montañés” represents the maximum level of perfection achieved by Spanish naval architecture. Full ship model kit Montanes description, photos, video and benefits. San Ildefonso model ship – discover one of the fastest ships in the Spanish fleet in Trafalgar battle. Full ship model kit San Ildefonso description, photos, video and benefits. 19 men made a remarkable voyage in Bounty launch. Full ship model kit Bounty launch description, photos, video and benefits. HMS Revenge was an English galleon which under Sir Francis Drake's command participated in several battles. Full ship model kit HMS Revenge description, photos, video and benefits. The Golden Hind was an English galleon best known for her circumnavigation of the globe. Full ship model kit Golden Hind description, photos, video and benefits. Full ship model kit Buccaneer description, photos, video and benefits. This ship was originally built as a collier in Whitby and was bought and refitted by the Royal Navy in 1768. The works included the addition of a further deck to provide cabin accommodation. She was then re-launched under her new name Endeavour and went on to become famous as Captain Cooks ship in his scientific journey of discovery. Full ship model kit Endeavour description, photos, video and benefits. The Mercedes was a well knows Spanish frigate, which was transporting silver and gold. Full ship model kit Mercedes description, photos, video and benefits.